I happened to get a great deal on some small gear reduction motors. I think they were used for electric windows in cars. I started with an old piece of metal from a freezer door and cut a small square to mount the motor too. I then took a 1X4 of 3/4 wood strapping and cut 2 half circles. You will note they are spaced apart to make a 6 inch circle. I wanted a space as they will be bolted together to draw tight---like a clamp---on the 6 inch ductwork. One piece is a bit further from the edge of the circle to the edge of the board. This is the distance needed for when the motor and shaft are mounted. You will see as we go along. 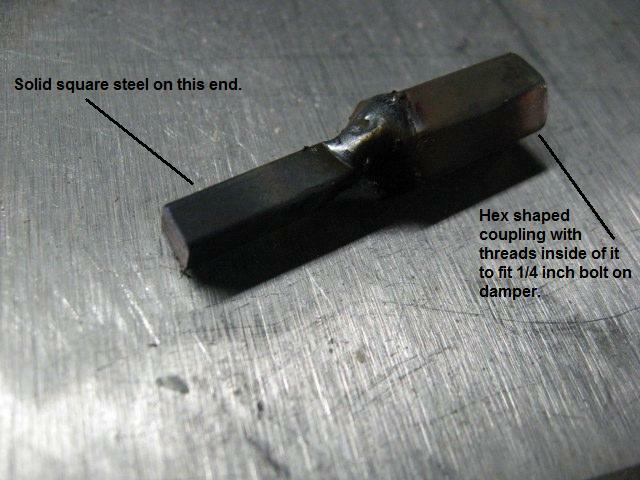 Here is the small square of metal with the motor mounted to it. 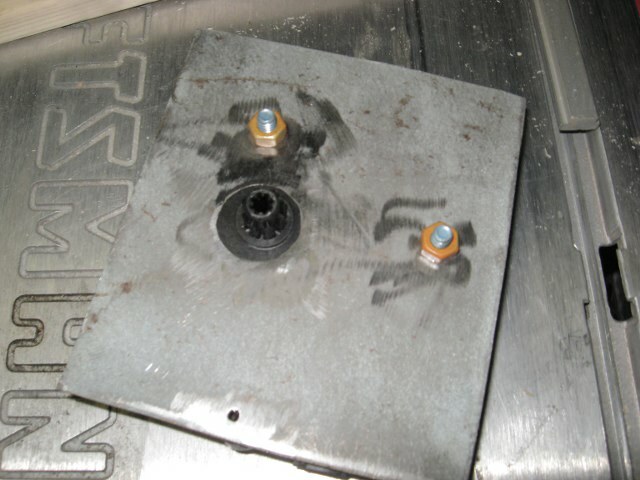 A hole was made in the metal for the motor shaft to protrude through on the other side. Here is the other side showing the motor shaft. I had was trying to figure how to join the motor to the damper flap. The damper is on the right. I took it out of the ductwork for now. You can see where it has a nut to hold it in the hole in the dict. 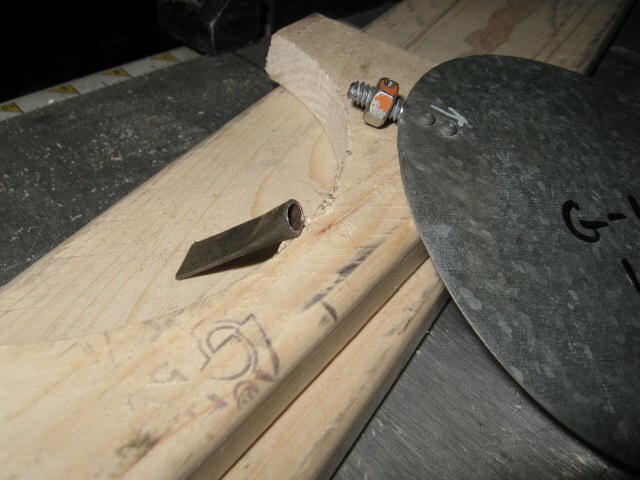 It doesn't not go through both sides so depends on the nut to keep it fairly straight in the duct. The shaft the nut is on is flat on two sides. So I thought I would flatten a piece of tubing to fit it. Then on the motor side there are groves inside of the motor shaft. I would shape the tubing to be a thin sliver of metal to slide into the grooves. Here the tubing is flattened onto the damper shaft but is too wide to fit into the motor shaft so will need to be shaped. As the tube was ground down it split into two thin pieces---but would now fit into the grooves of the motor shaft. Here I tested it but just felt it was too flimsy and might wander a bit and not hold the damper exactly where I wanted it. So I scrapped this idea. This was plan #2. I know it would take a bit more time as I had to drag my welder out. But the result was much better. this is a tad dark to see...but on the left is a piece of square 3/16 steel shaft. 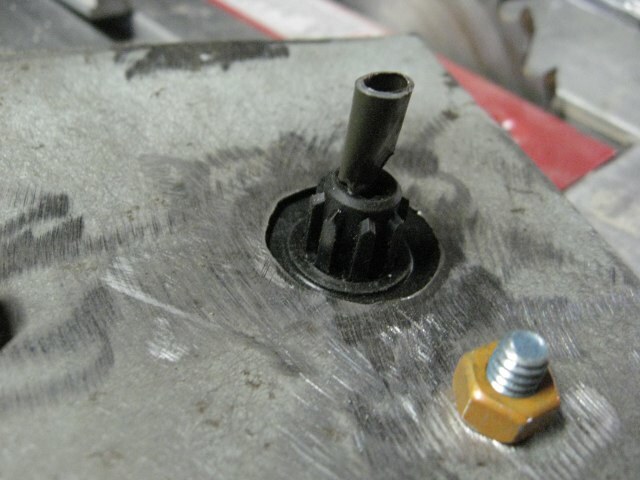 The slots in the motor shaft take a 3/16 square shaft into the middle of them and are very tight around it. On the other end is welded a 1/4 treaded coupler that will screw onto the damper shaft and up tight against the damper bolt. This is MUCH better. 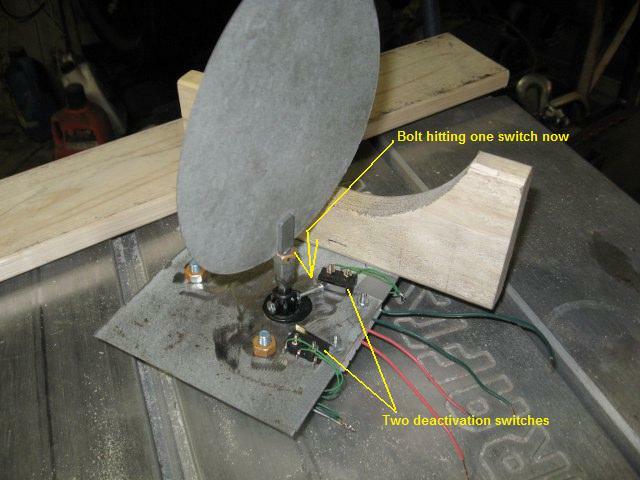 Here the metal and motor are mounted to the 1/2 wood circle. It's a tad hard to see---but I have drilled a small hole through the base of the motor shaft. It's plastic and drilled easily. Through it I bolted a small 4-40 treaded machine screw that protrudes ad the shaft turns. Mounted on each side are lever switches (sometimes called snap switches) that activate when the screw hits them. 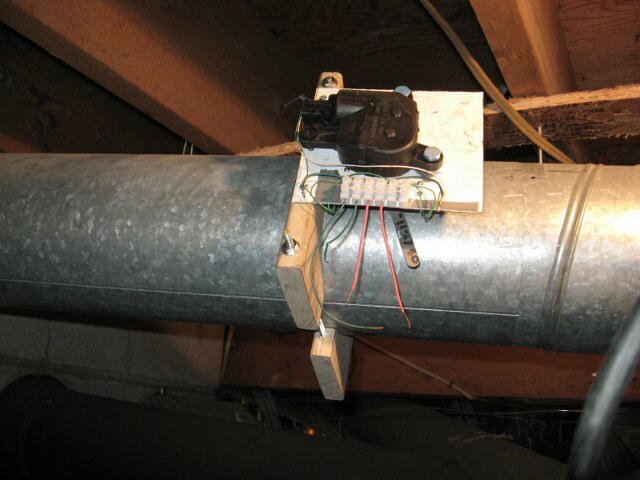 This allows the motor---and damper---to turn to the closed position and stop. When the screw hits the switch it opens it up and stops the power to the motor. As it opens in on part of the switch---it closes in another---and sends a signal to activate an LED light to signal that the cycle is completed in that direction. The a switch is thrown from the control area and it cycles 1/4 turn back until hitting the other switch and stopping in the open position. Here it is being tested with the damper flap on it. 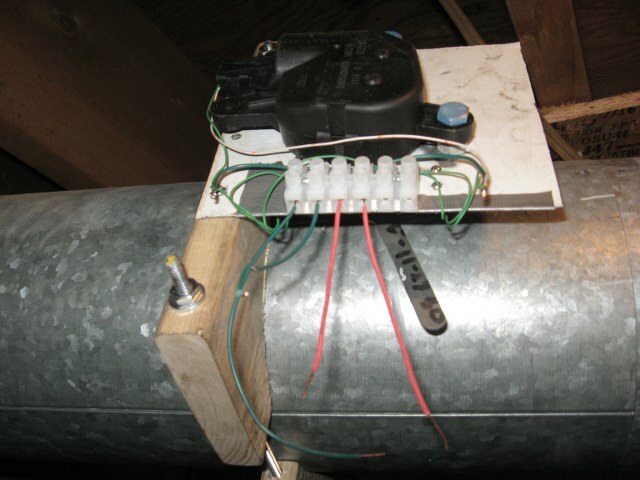 This is how it will mount to the 6 inch duct pipe---only the damper will be inside while the motor is outside. The unit is now mounted to the duct work. 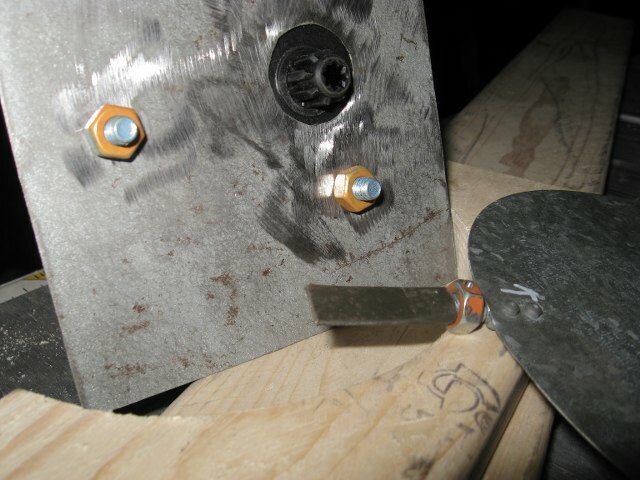 Holes were drilled through the wood to take two rods of 6-32 thread--with washers and nuts at each end to tighten it all in place on the ductwork. The motor shaft snaps onto the square stock that was threaded to the damper. There is a small lever of steel that went on the damper shaft to show it's position inside. The steel was loose so even though it looks slanted to the right a little---it really is up and down to depict closed. 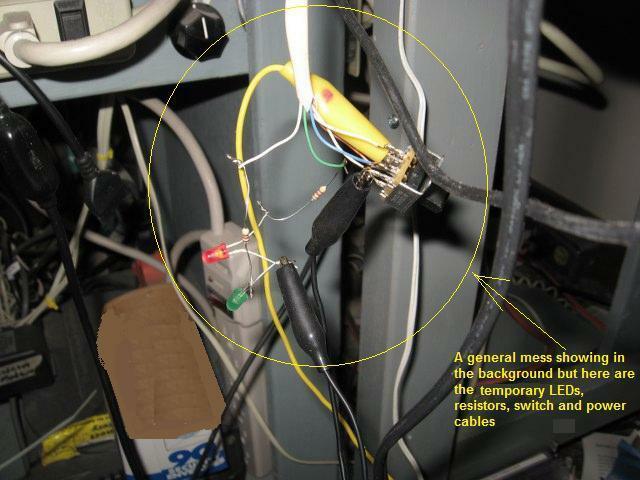 This shows a small terminal strip that was added to make it easy to wire a cable to or to take off to repair or perhaps put somewhere else at a later time. 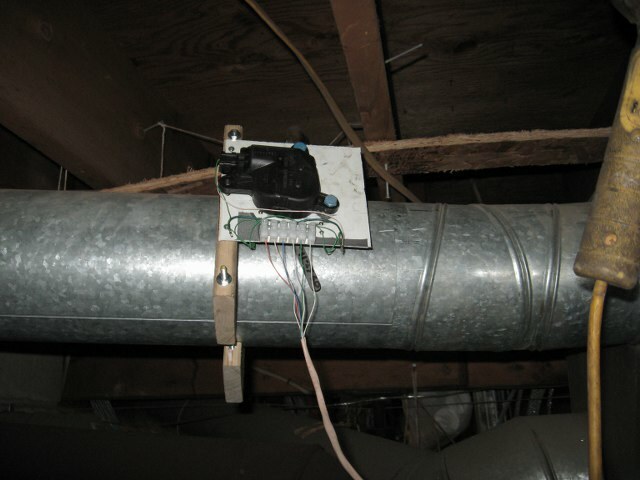 Here a temporary cable is attached to lead upstairs to the room it controls. 6 wires are needed. Two power the motor one way and two power it the other. Then two feed the 2 LEDS to show when it has finished a cycle. This is about as Mickey Moused as you can get. I have power from a battery going to a DPDT switch. 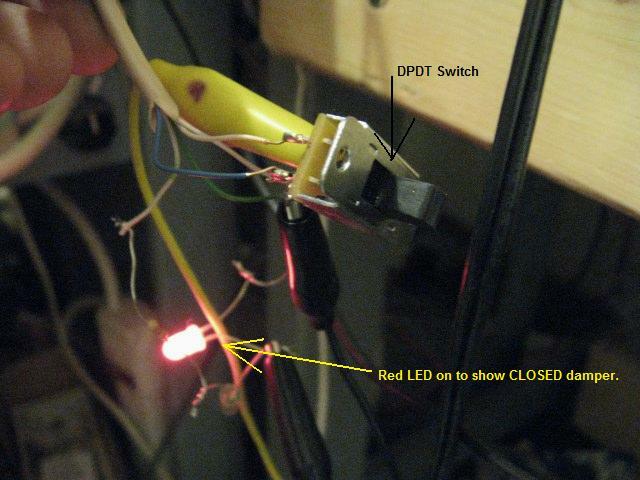 There are two LEDs temporarily soldered to the lead in wires and resistors to lower the amperage to them. One light is green for when it has reached "open" and the other is red for when it reaches "closed." 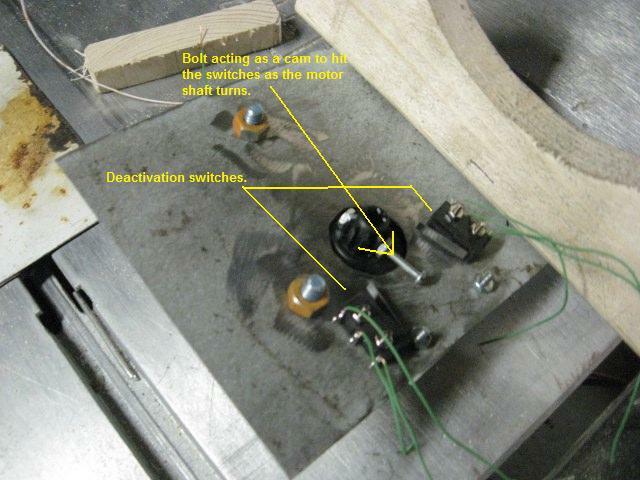 Here the power has been applied---the switch thrown---and the motor and damper cycled to the close position and turned on the red LED. Now to make a few more of these. This was a prototype so I wasn't sure what the final materials will be. The wood looks kind of amateurish---but then again---it clamped really well. Maybe I'll just put the paint to it all later. Plans are to later incorporate room temperature sensors and a master setting that will open and close air flow as needed. But for today--this was just the first baby step.